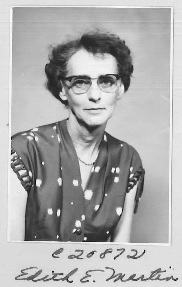 Growing up in Harrison, Arkansas, Edith wanted to become a missionary and serve in Africa. After graduation from Peabody and Scarritt Colleges in Nashville, Tennessee, she was commissioned in 1931, and spent the next thirty-six years in Zaire (Congo) involved in Christian education, women’s work, social evangelism, directing schools and writing materials for school and church. She translated the whole Bible into Otetela, one of the languages of the people of Zaire. Soon after her arrival, Edith was given the name of “Mama Yema,” which means kindness, mercy, love. Frequently the recipient of honors and awards in Africa and in the United States, she accepted them all with words of humility learned in Zaire, “Lusaka, Lusaka, Kete L’Ote” (“Thank you, thank you, with dirt on my head”). Her furlough time was spent in study in schools in Belgium, France, and the United States including Schools of Christian Mission. After retirement, she returned to her hometown and continued to witness to churches and groups throughout her jurisdiction. She established a scholarship for young people in Africa. A beautifully human person, an inspiration to all, she always wanted others to know Christ as she did.